Abercrombie just posted this to his blog. 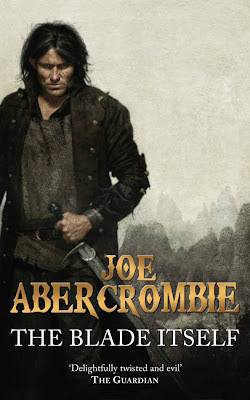 His UK publisher will be reissuing the First Law series as small mass markets shortly and have opted to change the covers using art by Chris McGrath who is better known for his Urban Fantasy art. I'm not sure about the move as the parchment art has become so synonymous with the series. I do like the illustration of Logan, but it doesn't feel right to me for the cover. I could have seen it as an interior piece to the Sub Press Limited Edition though. There are plans to do Glokta on the cover of Before They Are Hanged and Jezal for Last Argument of Kinds. I've been wondering who would be doing the art of the Sub Press edition of The Blade Itself. Maybe the mystery is now solved. The author's vision of a character is fine, but in reading you form your own pictures. Even if the picture you form doesn't match the author's, it still isn't 'incorrect', but like a movie made from a book, once you have a concrete image laid down of what a character looks like, it often becomes difficult to imagine anything else. I hear you. It is sort of like when your favorite book gets turned into a movie and you shout "But he doesn't look anything like..." And how the hell will they pull of Glokta? Blech. Jumping some sort of urban fantasy bandwagon. This would, as you point out, be lovely interior art (even if it isn't how I see Logan at all). But a mundane cover for an exceptional book.